My family and I love Brussels sprouts and are always looking for new ways to serve them. While out to dinner recently with friends, I tried Brussels sprouts with balsamic reduction for the first time and fell in love with the flavor. Over the next few weeks in my home kitchen, I played around with different ingredients and balsamic reduction until I found a winning combination! 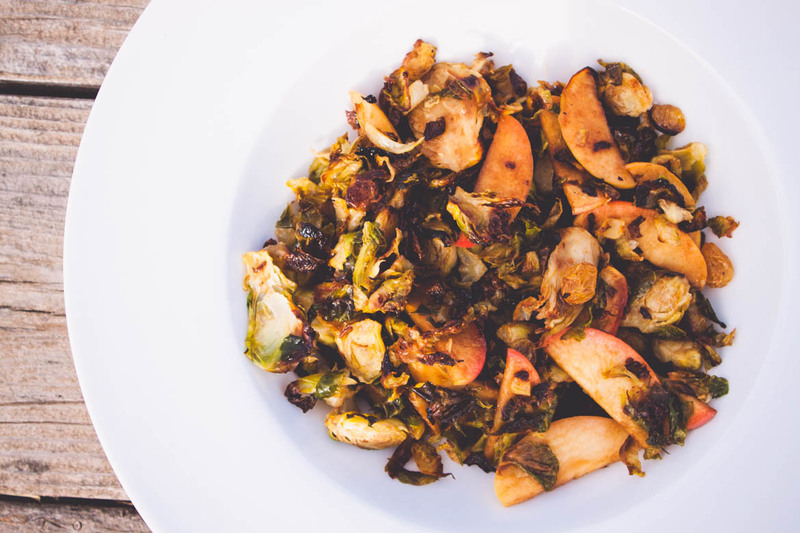 Read below for the Savory Brussels Sprouts with Apples and Balsamic Reduction. As a side note, I like serving these with BBQ Pork Ribs! For my Dad’s fabulous gluten, dairy and sugar free recipe, click here! Put Brussels and sliced apples on a cookie sheet, drizzle lightly with olive oil. Bake at 400 degrees for 25 minutes. Once time has passed, check to make sure Brussels and Apples have reached desired consistency (slightly toasted and brown at edges). Cook longer if needed, watching closely. Remove and place in mixing bowl. Add 1/8 cup golden raisins and bacon crumbles. Drizzle with 1 TBS Balsamic Reduction. Salt and pepper to taste. Mix well and serve. Optional: 1/4 cup chopped walnuts and garnish with watercress. To make this dish vegan, simply omit the bacon crumbles.